The reason for this being that they are smooth, creamy, bland enough to go well with anything and, best of all, full of healthy fats. In fact, their high performance in the fat stakes is what clued me into the idea of using them in cookies. It’s as easy as swopping out your usual fat of choice (in my case butter) and replacing it 1:1 with smooshed up avocado. It seems obscene and somehow wrong..like a cyclops kitten or a three-headed frog (I’m not making this stuff up) but, by the time, it gets to the chocolate, you’ll have readjusted. Oh and these are gluten-free and grain-free so all my paleo pals can indulge too. Everyone’s invited to this party! Except those with weird avocado allergies but is that even a thing?! Before tucking in, I need to do a bit of expectation management – don’t go into this expecting your usual cookie texture cos that ain’t the way it’s going down. These are a moist, fudgy consistency. Make those suckers small because they are pretty filling. That said, they lasted about two days in our house. Usually I blame my disgusting greed on the dog but he can’t open the fridge on account of him not having any opposable thumbs so that’s out. Break the chocolate into chunks and place in a small, glass bowl along with the honey. Carefully position this bowl over a pan of simmering water and leave it for around five minutes until the chocolate melts completely. Remove from heat and, while it is cooling slightly, whisk the eggs, milk, vanilla, cocoa powder and avocado together. Add the melted chocolate, a spoonful at a time and stir continously. It should be a thick runny batter now. Sift in the coconut powder, stir. Dollop a tbsp onto a baking tray (lined with parchment paper or greased) to create ten blobs. Bake at 400 for 10 minutes. Do you know the carb content, are they diabetic friendly? I’m sorry Linda…I’ve no idea about the carb count. You could try putting them into fitday and that might give you an idea. You had me at “dark chocolate”. Then came “avocado” and I actually let out a weird little audible squeal of delight (my daughter thought I was watching cute kitten videos on youtube again). I’ve got the whole gluten-free thing going on so I’m going to have to try these out! And heck yes to the chocolate! Have you ever had avocado chocolate pudding before? Tasty! I have indeed, in fact I expect it to make an appearance on here some time soon. It’s so creamy and yummy! Oooh, excellent. Let me know how it goes! What an intriguing idea, I love avocadoes and the thought of their smooth creaminess combined with chocolate sounds wonderful. I’ll have to try making these, thanks very much for the recipe. Saw your neighbors and they said they loved the cookies! lol They do sound good and so different! I’ve never used coconut flour, but I’m sure I could find some. Thanks! I believe you can get coconut flour in Wholefoods-type places. Can’t be much help since we don’t really have any US stores around these parts. It seems expensive but a little goes a really, really long way. Oh my goodness! Once I can start eating chocolate and honey again, I will be making these. Awesome!! Extremely interesting. As a chef I don’t often say that as I feel like I have seen almost everything. I may have to try this one. I would not say shocking but definately interested. I am going to make these tomorrow since I will be cooking for a huge school that has 12 gluten allergy kids. I will let you know what the kiddies say! Please do – kids are the harshest critics. Hope it gets a thumbs up. Love the idea of using avocados for their fat! I adore avocado ice cream for its fatty richness and I am totally going to make these cookies for the same reason! Thank you for this! Came this way via Dessertstalker and I think I may have finally found a treat that my gluten-free vegan coworker can eat…but to really make it vegan I need to swap out the honey. What about maple syrup or plain raw sugar (both of which I have in the house)? I’d go with the maple syrup. It’ll be a richer flavour but that’s never a bad thing. Hope your coworker likes ’em! To make it vegan, not only do you need to swap out the honey, but you also need to swap out the eggs. wow, trying this recipe soon! Wow, these look fantastic. I have all the ingredients, too! Yay! Gonna try ’em. Hi Andrea. I’m v impressed that you have all the ingredients to hand (that never happens to me, all recipes include a last minute dash to the shops). Believe it or not, yes! You don’t even taste the avocado and they make for a nice, moist, fudgy texture. These sound great! Do you think egg whites would work well instead of whole eggs? Hi Tina, I’m not sure about that one. For one thing the consistency wouldn’t be as moist and cakey. Plus coconut flour is a delicate flour to work with, it really requires whole eggs. Of course, if you’re allergic or intolerant, I appreciate that this doesn’t really help. Thanks! Also, does melting the chocolate have a specific purpose? I have dadrk chocolate chips at home and am wondering if I can just put them in as chips, or if it needs to be melted for consistency purposes as well? Would love to try these but don’t know if I can get coconut flour here…never heard of it either, come to think of it. Maybe I can find it at an Asian grocery store? Yep, I understand coconut flour isn’t as widely available in the UK. I’ve a hard time getting it when I’m home too. What I usually do is head for the nearest health food shop. These usually carry it and, if not, there’s a good chance they’ve heard of it at least and should be able to point you in the right direction. G’luck! terriskitchenuk – you can get coconut flour from Holland & Barrett. It’s £6.79 for 500g but it does go a long way. Hmm, this is a tricky one Jeanette. Coconut flour is a very distinctive flour so it can’t be substituted one on one with other varieties. If you want to make these with wheat flour I’d just look up a standard chocolate cookie recipe and swap out the fat (butter usually) with the same amount of avocado. I just figured the cocoa powder would take care of the hiding part, but I am not afraid of green cookies…we shall see about my three year old though 🙂 I will let you know! YUM! These sound incredible; I love the idea. Also, St. Patty’s day is coming and these would be perfect for green cookies. Good point Richard. I’m not a fan of artificial green food colouring so avocado is perfect. I’m sorry to hear that Lorna, mine were sweet enough for us so not sure what went wrong :(. I’d suggest upping the honey to a tbsp and using milk chocolate instead of dark – perhaps that will help. 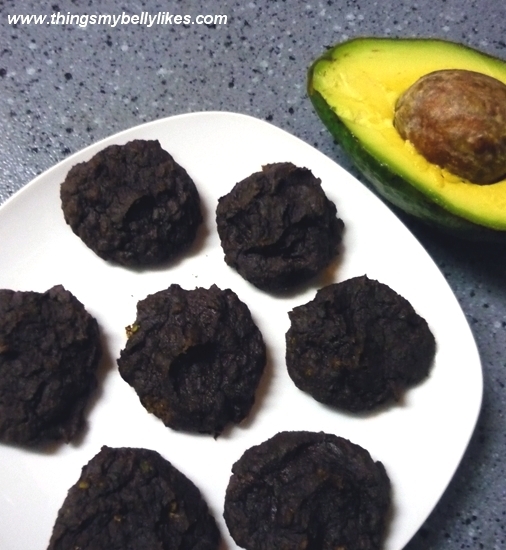 Please don’t let this put you off – avocado cookies really are awesome. It is strange, the texture and look of them was great so I was happy with that, it was just the taste. However, I covered them in milk chocolate and that seems to have done the trick. I must admit, the smell in the kitchen when they were baking was amazing! If I make them again I’ll just up the sweetness, as you suggest, thank you. I love this recipe b/c it’s so healthy, and I’m on the hunt for coconut flour recipes b/c I have a bunch of it. It doesn’t seem like there’s enough sweetener so I might have to up that, as we like dark chocolate as long is it’s not too bitter. Thanks! Hi Veronica. Thanks for stopping by, I highly recommend this recipe – it’s really different but delicious. I’ve weaned myself off sugar over the past year so am really sensitive to it. If you want it a bit sweeter I’d up the honey to a couple of tbsps – that should make it extra yummy. Enjoy! HOLY JESUS, KRISHNA and all the other folks! I want to taste these so bad right now! 🙂 I love your enthusiasm Melissa! I loved it so much I scared the dog by shrieking with laughter. That looks amazing… Def trying this recipe. Thanks Christian. Hope you like…be warned a couple of people have said it’s not sweet enough for their taste. My advice: taste the batter and work from there! Thank you so much Yasmeen, appreciate it and thanks for reblogging – you’ve made my day! I thought I was seeing things and had to look twice. This isn’t a catchy title, it’s real. 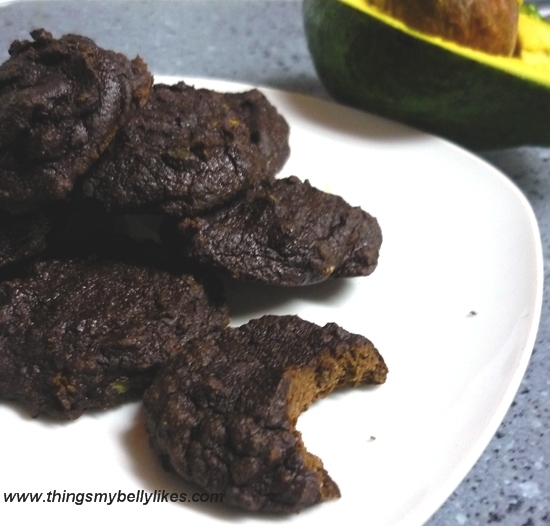 Dark Chocolate cookies made with Avacados! – Oh my Gosh. I’m not domestic and yet I suddenly need to make these. OMG! My two favorite foods in a cookie? I will have to try this. I am so excited! Thank you! Wow….I have have have to try these! I’ve seen this in a mousse version!! I cannot WAIT to try these. They look absolutely amazing. I am loving your blog and cannot get enough of some of these wonderful recipes 🙂 Thanks so much for sharingg! Do you think this could work as a pie crust? Hi Lisa, I’m not convinced that it would. The texture is a bit too soft and crumbly but you could always play around with the recipe (add more flour?) to see if you can get something that would roll out like a dough. Let me know if you experiment & thanks for visiting! I JUST made these…I think I need to get a different kind of chocolate. I used unsweetened baking chocolate since I’m trying to do the whole paleo thing and I used 2Tbsp of Honey and they turned out like little hunks of brownie and were incredibly bitter…so I think next time I’m going to maybe try semi-sweet chocolate instead of the unsweetened kind. Thanks though! A truly amazing recipe! I suspect my belly would LOVE these! One of my favorite mousse recipes on The Humble Foodie (my food blog) is a dark chocolate avocado mousse, so I’ve been awakened to avocado-in-dessert possibility for awhile but have not experimented much. The moist and fudgy consistency is what I always go for in cookies. Can’t wait to try! I can’t believe what a prolific cook and baker you are- new recipes every day, and they all look fabulous. Hi Alicia, thanks – I love cooking so it doesn’t feel like a chore (most days!). These are definitely winners but some have commented that they’re not sweet enough for them so be warned – up the honey/choc content if you’ve a sweet tooth! Ooh good to know…I do have a sweet tooth but also like to test Paleo baked creations on friends (and then surprise them by explaining that they have no refined sugar/dairy/flour) who expect sweet treats. Thanks! What a great combination! Love your blog, your creativity in the kitchen, and your witty writing 🙂 Can’t wait to read more! Made these today and only two cookies left! Will definitely be making again! Yum! Just remember, you might want to warn people it’s not vegan because of the eggs and honey. I saw a commenter saying something about giving it to a vegan co-worker but needing to swap out the honey, but she didn’t mention anything about swapping out the eggs. She might’ve forgotten, but other people might not realize it isn’t vegan, so you might want to put that somewhere. I just made these and unfortunately I really don’t like them. I did use almond flour instead of coconut, maybe that is why? They are very bitter. Blugh… These were terrible. I’m sorry, but feel the need to be honest. As a lover of avocado and chocolate these fell short and straight into the trash. What a waste of ingredients. I want to make these but I’m trying to avoid sugar…do you think I could sub stevia for the honey? I’m not sure about the quantities sorry (I don’t use stevia in my baking) but I don’t see why not! Hi Jezwood. I would suggest something like maple syrup or blackstrap molasses if you can have them. Taste the batter as you go to get the desired sweetness. Hope you enjoy! No I can’t have either of thoughs ingredients. I thought maybe Walden Farms maple syrup or DiVanci Sugar Free Syrups but the consistency is alot thinner. If I were you, I’d use the maple syrup and just use a little less than you would with the honey. I have these cookies baking in my oven right now! The batter tasted good…not too sweet, so I added a few drops of liquid stevia in addition to the honey the recipe calls for. I also put a small piece of walnut on top of half the cookies, just to give them more ‘chunck’! I doubled the batch and ended up with way more than 20 cookies! Bonus for me!! I’m taking them to a church picnic tomorrow. Can’t wait to taste them! Disgusting! I thought the other negative comments had neglected to add sweetener or tried to make them vegan. Nope! I threw away the entire batch… and I worry a bit about people who “like” these. Perhaps they’ve been paleo too long! I’ve got to agree with Anastasia and Karla. I appreciate the effort and creativity that went into this recipe, but the cookies were absolutely terrible. Despite drastically increasing the amount of honey, these turned out to be extremely bitter, and the avocado flavor drowned out the chocolate. That this recipe only calls for 1 tsp. of honey is offensive, frankly, and is enough to make sure I never visit this site again. I feel sorry for the writer, as she must be very accustomed to terrible food if she found these in any way pleasant. I just made these… After reading the comments I decided to use 2 Tbl of honey…. My kids (2 and 5) love them. I might even use less honey next time.